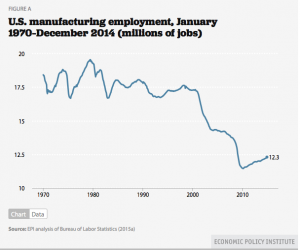 Between January 2000 and December 2014 the U.S. lost 5 million manufacturing jobs. There is a common perception that increases in productivity caused this decline, but the real reason is a growing trade deficit. Exports increase demand for U.S. manufactured goods while imports reduce this demand. Unfortunately since 1997 the trade deficit has been widening (it only experience a temporary decrease during the financial crisis in 2009 due to lack of short term trade financing). In 2014 it reached 514.6 billion or 3% of GDP. According to Robert E. Scott, the main cause of this trade deficit is currency manipulation which lowers the costs of U.S. imports and raises the costs of its exports. – End currency manipulation and advocate for an international organism that regulates China and about 20 other countries that consistently purchase foreign assets to suppress the value of their domestic currencies. – Enforce U.S. fair trade laws to reduce the flood of illegally dumped and subsidized imports. – Upgrade and expand the infrastructure. The American Society of Civil Engineers estimates that the U.S. needs to invest nearly $3.6 trillion rebuilding its infrastructure. All these steps taken together could easily generate sufficient demand for manufactured products to recover most or all of the 5 million manufacturing jobs lost between 2000 and 2014. Growing trade deficits and the shortfall in demand caused by the Great Recession, and not productivity growth, have been the major causes of manufacturing job loss in this period.